I went to this movie alone, so my thoughts as usual flutter all over the place. To: should I have gone today, am I really in the mood? Did I drink enough coffee? Too much? I’m in debt. I shouldn’t have fun when I’m in debt, I should only be in misery and try to fix the problem. Maybe I am fixing the problem right now, somehow, here in the cinema? No, don’t be stupid. 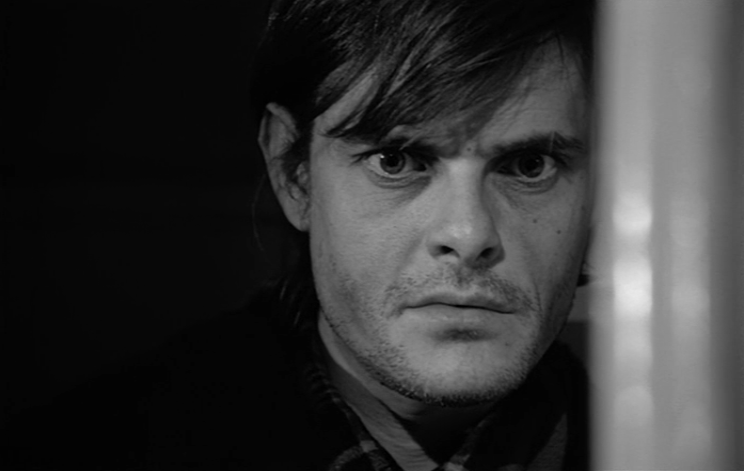 Anyway, is Béla Tarr “fun”? I certainly love watching the films, but is it “fun”? ...Okay, here we go, the light is dimming. Contrasts and colors weaken around me, everything is dark for a few seconds before the frame comes to the rescue and focuses my attention. On wind and rain. 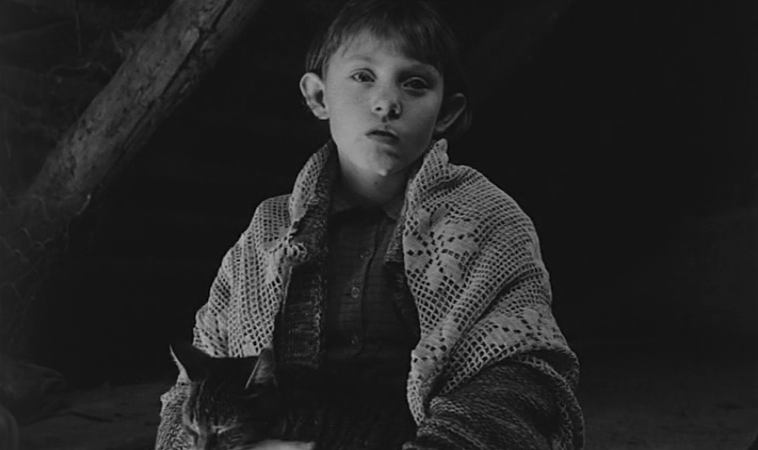 The weather seems like a constant, satanic force against the people we meet in Tarr’s films, and it flows over their decaying buildings, breaking them down slowly. The people huddle up inside the buildings and play music, which seems like their way of taming the wind, forming it into units of controlled sound - melody and rhytmn being weapons against the windy, chaotic qualities of the air outside. The wind might crash against the buildings and its chaos mock their symmetry, but the music mocks the wind right back. Still, a silent, heavy terror of meaninglessness is always nearby. People are sometimes merely abstract chiaroscuro carvings, thin lines of light constrasted against an oppressive black void. We float past both these people and these voids, not lingering more on one or the other, the symmetry or the chaos, but float past a face into a building into grain, a body into the void that now fills our vision. We float right by them as they mutter “why and how?”, and into a void that accentuates the distances between the minds, and propped up between them we find: columns, darkness, never-ending walls, never-ending speech, their very own faces. Propped up between the people are their very own faces, impenetrable even when their features are clearly discerned. The void isn’t always a dark patch contrasted to an abstract face, but as we stare at these fully lit faces for extreme lengths of time the void becomes the face itself, immediate, apparent, right there, but unknowable. These faces have creases like craters where the rainfall hit, sharply delineated foreheads that are perpetually furrowed from walking in the wind (this wind that would sculpt delicate shapes from these jagged faces were they only to stand still, but outside they always walk). Inside, their eyes are ever-fixed at something unspecific and suggest a constant barrage of thought. The environment only catches their investigative attention fleetingly, before they fix again and pull their attention back inwards, to exactly where we cannot go with them, back to their unending thoughts. There is an intense feeling of being outside people who are unknowable in all their silence. Unknowable, even when they do speak. A man has walked into a room, and the weather is with him. The wind captured in his lungs is formed into rhythmical pulses of sound designed to be received and decoded by the other minds in front of him. He speaks. A face describing habits, formulating incessant plans, consoling and bidding. Reflections and projections. Attempts to harness the wind, to tame and ridicule it, to reach out to another face that it never quite reaches. Never-ending speech, until the speech does end. And then silence. But these people are in constant opposition, and they prop up against this: A drink. Or a dance. Moving, partly to a rhythm given you, to a feeling of harmony (the tackled wind), partly to the satanic, windy impulses of your mind, going with the chaos instead of against it. A desperate cling to another mind who desperately clings back, who looks you in the eyes, drunk on alcohol, love, lust or all of it, and who hovers in the vicinity of your mouth, hungry to feel perhaps the best defence against the chaos: communion. Until, again, the inevitable end. Ever reappearing: the inevitable rain, the wind again unhinged, and you walk. And walk, and you walk, and you find your own rhythm in the step, and you think. About what lies beyond the unending fog, and you might as well look down and inwards, as up. Think about the other person, who is blocked off from you. About my own lack of ability to communicate. About why I always shout and how habits are no goddamn excuse. About habit and circularity. About possibilities of escaping myself, about “I promise I’ll change, but you have to help me” and about how I am dancing with the narrative now and feeling intense bursts of meaning and a feeling of truth that is independent of the meaning of the whole, but exists right there in the moment – the stretched out real-time moment that carves an oasis for itself and me in the midst of the momentous narrative, moments that are part of a whole, but so far apart in time that their connectedness seem subservient to their intense present. Yes, I remember that scene, I loved that scene, but that was the beginning of the film and I was a different man then. 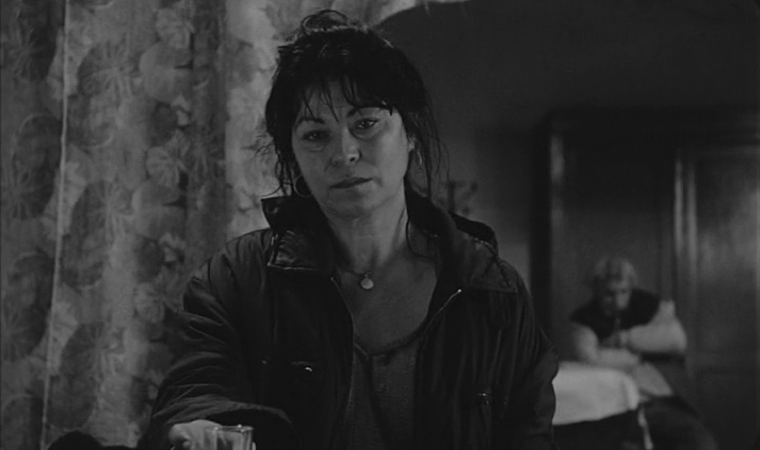 I find this hope in Béla Tarr: that though everything inevitably decays, it can seem long-lasting. Now the mock-finality of the cut-to-black. The steady wash of external impulses that has had such a defining impact on my flow of thoughts weakens. A whispered thought flows around inside me and mingles with my after-image of the narrative and says that was intensely beautiful. Another says sit differently. Surpressed thoughts push back, wish for space now that there is no frame to hold them back. I am still in debt. I’m a little horny, strangely. The whisper-thoughts accumulate into a steady cacophony, and ghosts of the ghosts of worn walls and people who sing or are turned around in dance, and who walk or sit and sit and repeat and “why don’t you love me?” are chased further back in my consciousness by the light coming on in the room. I can still see them but it takes a little bit more effort, and I turn my head for the first time in hours. My neck exists. As does the intense red of the curtain in front and the voices of people behind. Where is the film now? There, he is still walking. But with the voices in the room around me, and a certain expectation, and I am suddenly, intensely, here. Hello. It’s sometime in 2012. Mr. Tarr has been handed a microphone, so we can all find a focus and channel our thoughts one last time before the doors open and our minds melt together with the wind. I see only Mr. Tarr, I am in the front. I am wondering what I have just seen, what it adds up to. It was beautiful, but what does it mean? I am wondering if I should ask something. Mr. Tarr’s face can be deceptively like his characters’ faces. The beard, the length of the hair, his stare. But at times all this melts, and he gets a wonderfully warm and boyish look that is nowhere to be found in his films (and for some reason it makes me happy that this is the case). This appearance is held, and he speaks to us warmly about his films, until a disembodied voice washes over me from the back rows, hungry for elucidation from this authority.